Clear eyes are one good sign of health. Here's a healthy Diodon holacanthus in Malaysia. Hi Mr. Bob and crew, I am doing a lot of research on my next acquisition. I have a lot of time due to setting up a qt, cycling a new tank for the geriatric fin friends and redoing the 150g for a puffer. (new skimmer, added a 29g refugium, rearranging rock, new power heads..etc)I am finding so many different tank requirements for the different species. <There are many such requirements as INDEED there are different species. Give me a suggestion :)I want one of the personable species that can live its life in a 150 gallon. I read the porcupine gets too large. But even the others seem to get huge. Is there one that can live in my tank happy. I read they can live 10-20 years. It will be the only fish in the tank. I will not be upgrading tank size. similarly for other puffer families. Thank you for the reply, yes I am researching. When I noted the different tank sizes for different species, I should have clarified different tank sizes for each of the different species I have been researching. Some say 125 some say 180 and even some sites may say 75g for a particular species. 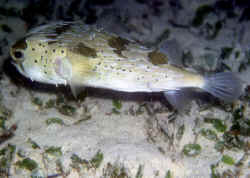 I am not set on a porcupine puffer or burr fish. I want the most suitable species that can live for decades in what I have. <A Diodon species will go here indefinitely.... You "need" to be told? Okay; get a Diodon holacanthus; right now! Ps.. I am a tad offended. I have been searching, researching or re-searching. I don't care what you call it. If I had not been re-searching then I would not know what a cockle is. I had never heard of them before, or thiaminase problems, or lock-jaw and dental problems. I have been looking where to find cockles, mussels, crabs, prawns etc to be shipped to me. Then I read they have to be rinsed well and frozen. Then thawed for my fish. Yes Mr. Fenner, I am searching. I am searching for a suitable fish for my tank and a suitable place to find him food! I did find cockles at Citarella's in NYC. Have a good day sir! My goodness you are a tough cookie. My first email asked for a suggestion. worry, I will never bother you again! Mr. Bob, We had a bit of miscommunication last week over a puffer fish acquisition. You apologized for the miscommunication even after I said some not so nice things. I too would like to extend my heart felt apology. I get too sensitive. I ain't making excuses nor want any sympathy. It is just an explanation to my attitude. I am extremely agoraphobic. I am so scared of people I have to take heart medication to keep adrenaline lower. The only people I talk to are people online. That is no excuse for getting perturbed when I've a question. You were right. I need to choose my own fish with my own due diligence. I thought it would be cute to have you choose a species. I am going to name him Bob :)I am going into my puffer acquisition as if I am buying a puppy. I am putting a lot of work into upgrading the tank and filtration (as learned here along with proper diet) I intend on emailing you in 15 years and telling how 'Bob' is doing :)I have learned so much from you. I am so proud of my almost 10 year old clown, (Elmo) my 10 year old starfish, (Star) and 5 year old clown (Maxine)Your works strive me to be the best I can be for my fin friends. They are not 'just fish' to me. They are my beloved pets. Thank you for the many articles I have read, the books, the access to read others questions. I am looking forward to getting my livingscape for the 40g. It should be here in a few days! My hubs burnt my other books :(He is a wee bit protective when he thinks my feelings are hurt. On the bright side, now I can buy the updated Conscientious Marine!!! I am too excited about that! He has been warned to leave my books alone! and doing due diligence for whichever one i choose. I would love to write an article about my experience. It will be about 2-3 months before I can get an article written. This should be my last question regarding the puffer acquisition. Last email I stated it would be the only fish, Arothron nigropunctatus. You said I could add more. Thank You so very much for answering all of my questions the past month or so. I am sure I was a pain at times. I now know why so many times you would say to keep reading. I learned more than I would have had you just answered my questions. Thanks for the fast response. Are there any puffers your would recommend that would do well with this cast of fish? Any puffers that are not tobies? Is the blue throat the best trigger for a 93 gallon cube, since there isn't much swimming distance? I have bought my first, and only, 125 gallon salt water aquarium. It is not set up yet or even at my house yet, however, I want to research the fish I will be purchasing before I jump in head long into this. Yes, I am aware of proper cycling techniques (I have freshwater now at home) and I have purchased live rock along with live sand from my LFS to help with the cycling of the aquarium. I am torn between purchasing a dog-faced puffer or a porcupine puffer. My LFS advises that I may have both in the same tank. I have read much conflicting information regarding housing puffers together. I do not want to have to upgrade the aquarium at a later date and I want to ensure they have the best habitat for as long a life span as possible in the 125 gallon. but I have decided not too as everything I have read suggests their life span is significantly shortened in an at home aquarium. Would a 125 gallon aquarium be able to house these two puffers for their lifetime? Thank you very much for your time. Jill J.